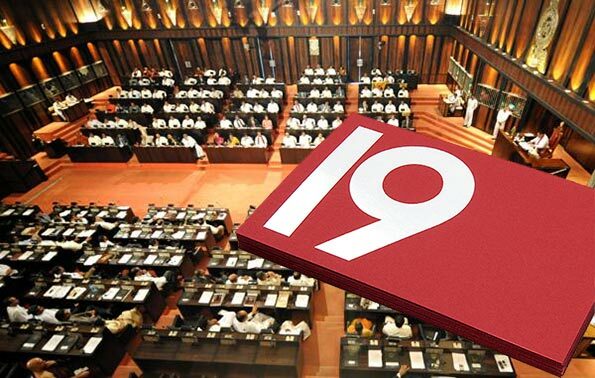 The 19th Amendment to the Constitution was passed with a vast majority in Parliament, a short while ago on Tuesday (28), with the government gaining 211 votes in favor of the amendment while 01 voted against it, 01 member abstained from voting. 10 members were absent. Earlier today the second reading of the proposed amendment passed with a special majority. 215 members voted in favor of the second reading while one member voted against it. Thereafter the committee stage discussion of the 19th amendment began. Following lengthy discussions between government and opposition MPs voting for the third reading of the 19th Amendment began at around 10.45 PM. Great news; the 19th Amendment passed by 214 votes and 1 against. What a great democracy we are. But will this 19th amendment bring any relief to the common man? Will it bring opportunities to ensure well-being of the common man and his family? The constitution is only for those aspiring to live in Janadhipathi Mandiraya and Temple Trees. The common man living in Kunu Thotalanga doesn’t have a clue what the constitution is or what it does. Sri Lanka has a serious issue; that issue is lack of “opportunity”. Does anyone care? Only one does, guess who? Time to have the general election now, and to have the vast public mandate confirmed for the government and set in concrete the Yahapalanaya, without further delay. It is not advisable to dabble with a ganja addict from his very birth , in addition to having a heap of goraka to hide himself in case things go wrong. However this addict very often frees himself from the usual resultant brain disorder and makes some sense in his comments. Two questions he had asked at the beginning may have been posed when he was little bit sober. I do not entertain any idea of living in Janadipathi Mandiraya or Temple Trees. I have my own mandiraya surrounded by a few coconut trees overlooking a vast span of green paddy fields. I do not live in Kunu Thotalanga either. But I have my version of the Constitution. It must guarantee my freedom of where to live. how to dress (descently of course) ,what and when to eat. freedom of movement .association etc. About your question as to lack of opportunity and who cares? M y answer is I do. I do have lot of opportunities coming in my way day in and day out. I am quite happy about it.